Having graduated in 1990 from the University of Glasgow with a Beng (Honours) in Naval Architecture and Ocean Engineering, he joined the University of Newcastle getting his Msc in Marine Engineering in 1991, while his dissertation was carried out at the TU DELFT in Holland. 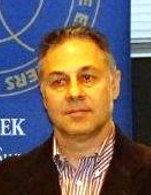 He is a TEE member and an active member with SNAME (Greek section, papers committee Chair), IMarEST and Martecma-Greece. He commenced his career in Ship repairs / drydocks at DOVANKO MARINE INC since the early '90s and up to 2004. Then he moved into ship management starting with TRISTAR MANAGEMENT LTD up to May 2013 and since then he is the Technical Manager at EUROTANKERS INC.
During the academic year 2015 - 16, he delivered a set of lectures at the University of Piraeus, for the postgraduate students of the department of Maritime Studies. He is also member of the Greek Technical Committees of DNV GL and BV.